In this competitive world, everybody wants to get aware of what others are doing in their sectors and what strategic drivers are followed by the others for the successful future milestones. But the drug future is only dependent on one thing and that is how much efficacy it is showing through its mechanism of action to improve the medical condition. So utilizing the most effective targets and technology, the drug can do million dollar business. DelveInsight released Mechanism of Action reports provides the targets-mode of action based information-across all the therapy under research work, pipeline products across all the companies, current technology, molecule type, stage, company finances, comparative analysis and therapeutic assessment at every step. These Reports propose specific strategies that could have the most substantial impact in improving R&D productivity. “We are really happy that our reports are showing potential in the market. We have become a strategic partner for the Pharma Companies worldwide” said Dr. B.K. Agrawal, Managing Partner at DelveInsight Business Research. These Reports highlights therapeutic targets and their mode of action; for instance Inflammatory targets: Reversible Anticholinesterases, Sphingosine 1-Phosphate (S1P) Inhibitors, c-jun-N-Terminal Kinase (JNK) inhibitors, Cancer Targets: Gamma Secretase inhibitors, IL-13 Receptor Antagonists and many more…..
DelveInsight’s Mechanism of Action reports is not only gaining importance but also has become the most known among the clients. These reports are available with many resellers like Report Linkers, Report Buyers, Research moz, ASD Reports, Report Stack, Bharat Book Bureau and Market Reports. Ask for sample reports now! This entry was posted in Business Consultant, Pharma Consultant and tagged Company Overview, company profiling, Discovery, Drug, Filed, IND filed, Indication, Market Research, Mechanism of Action, Pharm Insights, Pharma Companies, Phase I, Phase II, Pipeline Reports, Report Stack, Reports, therapeutics, Track your closest Competitors. 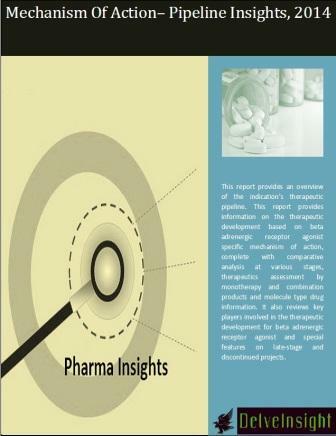 DelveInsight is helping worldwide Pharmaceutical companies with its Market Intelligence Reports. The infectious disease (ID) vaccine pipeline is rich and robust. However, indications such as HIV, Tuberculosis and HCV have high demand for the development of a first vaccine, and even routine vaccinations, such as those for influenza can be improved in terms of safety and efficacy. Such unmet needs are driving the continued development of ID vaccines. The research work for curing Infectious disease has rapidly assumed a prioritized role within the overall scientific portfolio. The number of vaccines development underway has increased substantially for the HCV, HIV, Tuberculosis and Influenza infections. Get notified about all the under development vaccines worldwide and the technology they are using, stage of development, their targets, mechanism of action with our Pipeline reports. The best strategic report that will not even give you the overall developing drug profiles but also therapeutic assessment and comparative analysis at every step such as monotherapy, combination, route of administration. This entry was posted in Business Consultant, Pharma Consultant and tagged Biotech, DelveInsight, development, Discovery, Drug, Filed, Hepatitis C Virus, HIV, IND filed, Indication, Infectious Disease, Infectious Diseases, Infectious Diseases and Vaccines, Infuenza infections, Market Research, Mechanism of Action, monotherapy, Pharma Companies, Pharma Company, Pharmaceutical companies, Phase I, Phase II, Phase III Pipeline, Pipeline Reports, Report Buyers, Reports, therapeutic Area, therapeutics, Track your closest Competitors, Tuberculosis, Vaccine. DelveInsight’s,“ Metastatic Prostate Cancer-Pipeline Insights, 2014”, report provides comprehensive insights about pipeline drugs across this indication. A key objective of the report is to establish the understanding for all the pipeline drugs that fall under Metastatic Prostate Cancer. This report provides information on the therapeutic development based on the Metastatic Prostate Cancer dealing with all the pipeline drugs, comparative analysis at various stages covering Filed, Phase III, Phase II, Phase I, IND filed, Preclinical, Discovery and unknown stages, therapeutics assessment by monotherapy and combination products and molecule type drug information. The report also covers the companies information involved in the therapeutic development of the products. It also has highlighted the discontinued and dormant products. – Identify the relationship between the drugs and use it for target finding, drug repurposing, and precision medicine. – Developing strategic initiatives to support your drug development activities. – Optimize your portfolio and keep you in touch with the rapidly changing pharmaceutical markets, and make the best decisions for your business. This entry was posted in Business Consultant, Pharma Consultant and tagged Business Consultant, Company Overview, company profiling, DelveInsight, Discovery, Drug, Filed, Generic Companies, IND filed, Indication, Metastatic Prostate Cancer, MOA, monotherapy, Pharm Insights, Pharma, Pharma Companies, Pharma Company, Phase I, Phase II, Phase III, Phase III Pipeline, Pipeline Drugs, Preclinical, Report Buyers, Report Linker, Report Stack, Reports, targets, therapeutic Area, therapeutic development, therapeutics, Top 10 Companies, Top 10 Oncology Drugs, Track your closest Competitors. DelveInsight’s,“ Brain Hemorrhage-Pipeline Insights, 2014”, report provides comprehensive insights about pipeline drugs across this indication. A key objective of the report is to establish the understanding for all the pipeline drugs that fall under Brain Hemorrhage. This report provides information on the therapeutic development based on the Brain Hemorrhage dealing with all the pipeline drugs, comparative analysis at various stages covering Filed, Phase III, Phase II, Phase I, IND filed, Preclinical, Discovery and unknown stages, therapeutics assessment by monotherapy and combination products and molecule type drug information. The report also covers the companies information involved in the therapeutic development of the products. It also has highlighted the discontinued and dormant products. This entry was posted in Business Consultant, Pharma Consultant and tagged Brain Hemorrhage, combination, Discovery, Filed, IND filed, Marketed, Mechanism of Action, monotherapy, Phase I, Phase II, Phase III, Pipeline Drugs, Pipeline Reports, Preclinical, Reports, targets.